Reach4Me is an Isle of Wight based property and landscape maintenance company. We are here to carry out any elevated maintenance tasks around your estate. Our vehicles have been selected for all terrains. Reach4me is happy to carry out elevated maintenance tasks for you or equally happy to just supply plant and operator allowing you to carry out your own maintenance. Reach4Me offer a reliable and convenient maintenance service. This option is a package of plant and tradesman to carry out your maintenance tasks whilst you sit back and relax. Before during and after photographs will be supplied leaving you in control and confident of the work carried out. Our wide range of fully comprehensive services are available to residential clients, local authorities, contractors, commercial clients, private companies and property developers in the Isle of Wight and surrounding areas. Reach4Me offer a service that provides you with our elevated vehicle and fully qualified and experienced Plant Operator. Save time & money by using our mobile elevated work platforms (MEWP) or ‘cherry pickers’ for awkward access at height rather than costly scaffolding. Stay on top of health and safety by not working from ladders. Save time and money by getting the job done quicker with our professional operators! The Land Rover Defender 130, our ‘cherry picker of choice’, has an operating height of 15m and its versatile design allows it to operate in all terrains. Also available is a larger vehicle with 22m scope. For those awkward access jobs we have available a narrow 15m scissor lift. With over thirty years experience our fully qualified operator can position the platform with precision. Our rates for access platform and operator hire are competitive and provide flexible packages to suit the smallest job through to long term contracts. Rates can be quoted by the hour, half day, full day or weekly. So however small or large the task is we are able and ready to quote. Our comprehensive liability insurance covers all operators, labourers, contractors and property. A copy of our public liability insurance is available to view upon request. Should requirements exceed the policy conditions we are happy to amend our policy to suit any larger contract requirements. Repair, maintenance or restoration of slate roofs and flashings. It could be as simple as one slate slipped and needs refitting. Or you may wish us to video an inspection of your roof for preventative maintenance or insurance claims. Strip and repaint facia boards.Replace or overlay with UPVC boards. We can fix that annoying leak from broken or missing gutter seals. Annually we can clean out your gutters and give them an external face lift while we are up there. This is a scenario where our mobile elevated work platforms can save you time and money. The most difficult part is gaining safe access to the chimney, which usually involves bringing in a scaffold company. If your chimney is very high, big or has a glass roof or conservatory directly beneath it, then the cost of scaffold can become prohibitive. Before it becomes a problem let us skilfully repoint the brickwork and bring back its strength and integrity. Maybe while we are up there you require a satellite dish installed or a redundant aerial removed. Does your log burner/log fire have back drafts? Let us install a cowl of your choice to eliminate them. You may want us to remove a birds nest or fit mesh over the pot. We can survey and supply photographs of any concerns such as repointing or cracks within the brickwork or pot. Having a log burner installed? We can assist your installer with elevating him whilst he installs and certifies the flu liner. We can supply surveying and photographing of roofs (including solar panelling) for estate agents, private home buyers, Insurance companies and building societies for mortgage lending purposes. Let us clean or repair those awkward to reach windows. Perhaps they require a coat of paint while we are up there. Cracked or broken glass can also be replaced. Crown reductions. Dead, dying and dangerous trees or timber removed. Section felling in confined spaces to safeguard property. All our tree management technicians are fully qualified and experienced chainsaw operators. We offer flexible terms on the felled tree. Services available range from removal and disposal to cutting and splitting on site. Don’t stand dangerously on the top of your ladder. If its too high call us in to safely trim back to your requiremnts and leave us to dispose of the cuttings. All aspects of painting undertaken. Let us install any lights you require at just the right height to optimise its beam. We can attend for simple bulb/filament replacement or to troubleshoot. Fully qualified electrician will assist in all your requirements or choose plant operator option and supply an electrician of your choice. Available for carnival season. Maybe your flag needs replacing or the rigging is jammed. Christmas tree and street decoration installation catered for. Get that great shot for estate agents of your house and grounds. Capture all your wedding guests in one photo. 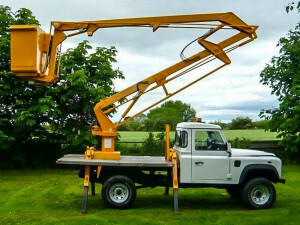 Hire our vehicle and operator for any elevated work requirements as our list is just a selection of applications for the Land Rover M.E.W.P. For a free, no obligation quote for any of our services, please fill out our online quotation form. Reach4Me work alongside a number of property management companies and landlords/tenants to help clean, maintain and manage both residential and commercial properties on the Isle of Wight and surrounding areas. We can carry out general maintenance and additionally jet-washing, graffiti removal, external painting. Elevated lighting maintenance, Tree management and many more applications. Our services are competitively priced, and we ensure quick, reliable and efficient services to our clients and their tenants. Reach4Me welcome working alongside insurance companies to quantify insurance claims. We can elevate your insurance inspector to carry out an initial survey without scaffold. Equally we can inspect and photograph damage on your behalf and forward it electronically within seconds of taking the shot. Detection could result in a conclusion and a simple fix.We are also happy to make good leaks whilst awaiting scaffold as a damage limitation exercise. We welcome any contract work with the Isle of Wight Council, Telecom Service Providers, Southern Vectis, Island Roads to name a few. Should a contract offer require an enhanced insurance cover we are happy to accommodate. We have researched carefully to ensure all eventualities are encompassed within our policy. We have a fully comprehensive public liability insurance to the sum of five million pounds. Any tradesman or customer is automatically covered whilst in the basket of the cherry picker. In the unlikely event of an occurrence we have the comfort of knowing insurance is there to cover us all. A copy of the policy is retained in the vehicle and can be referred to by both operator and customer at any time. Awkward Access? Yes, we do! between the houses to get to the back elevation. 92 inches required with outriggers deployed and just 94 inches available! With Daisy well positioned, the boom elevated and then slewed to clear the corner of the neighbours house and conservatory. Once on the roof the offending slate was replaced within 30 mins. Including a cup of tea the job was all done in under two hours! Our goal with this new website is to provide our current and prospective clients an easy way to learn about the services that Reach4Me are able to offer to residents and commercial customers on the Isle of Wight and surrounding areas. 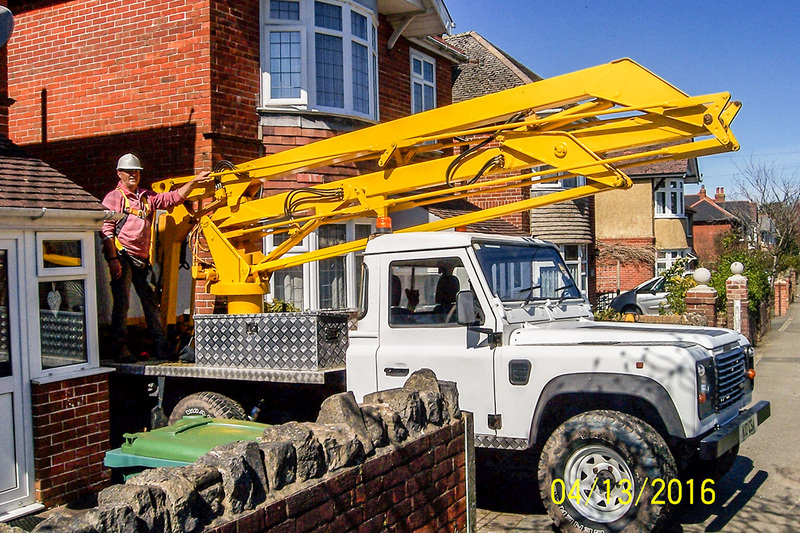 April 1st, 2016, Isle of Wight: Today sees the official launch of a brand new property and landscape maintenance company, specialising in elevated and awkward access services. Reach4Me offer a wide range of services, and are able to carry out works at height for you, supplying both plant and professional tradesmen, or supply plant and operator allowing you to carry out your own maintenance. Great service he can do my gutters next then top a tree then the hedges then remove moss off the shed! a handyman to know.